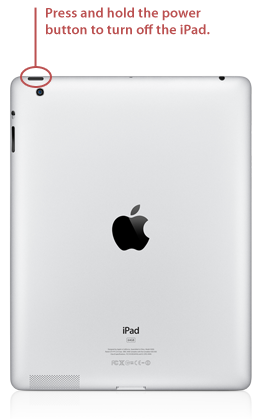 Press and hold the power button on the top of the iPad's case, as shown below. A red slide to power off slider appears on the screen. Slide the button to turn off the iPad. 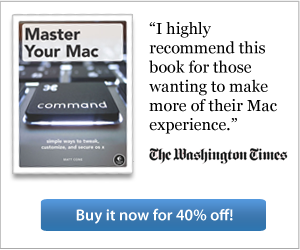 Your iPad will turn off. Note that it's not entirely clear why turning off your iPad during takeoff and landing is a federal regulation. In fact, the FAA is currently reviewing whether or not passengers should be allow to use iPads during takeoff and landing. Unfortunately, you must still comply with this regulation for the time being. From the iPad's home screen, tap Settings. The screen shown below appears. Slide the Airplane Mode switch to the On position. The iPad is now in Airplane Mode. You can always tell whether or not the iPad is in Airplane Mode by looking at the top bar - the airplane icon will be visible when Airplane Mode is enabled. Congratulations! You may now legally use your iPad during the flight. Feel free to watch movies, listen to music, or use any of your apps. What Happens When You Enable Airplane Mode? When you enable Airplane Mode, the iPad disconnects from any cellular and wireless networks and prevents you from automatically reconnecting to those networks. Bluetooth, Location Services, and GPS will also be disabled. All of those wireless technologies could potentially interfere with the avionics in the cockpit. Airplane Mode automatically disables Wi-Fi and Bluetooth, but most federal regulations allow you to reenable these wireless protocols while airborne. This is useful when connecting to in-air wireless networks, or using Bluetooth devices, such as a Bluetooth keyboard. Tap Wi-Fi on the sidebar. The screen shown below appears. Select a wireless network from the list. Your iPad will connect to the network. To enable Bluetooth, tap General on the sidebar. The screen shown below appears. Move the Bluetooth slider to the On position. You can now connect Bluetooth devices to your iPad. 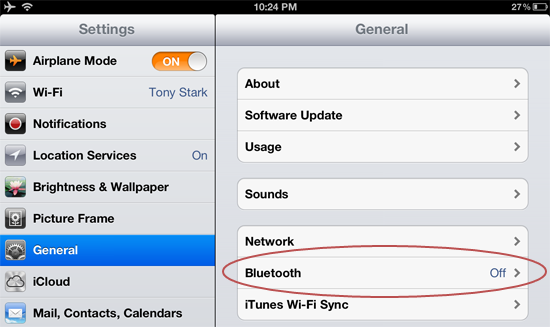 You've successfully enabled Wi-Fi and Bluetooth while using the iPad in Airplane Mode. 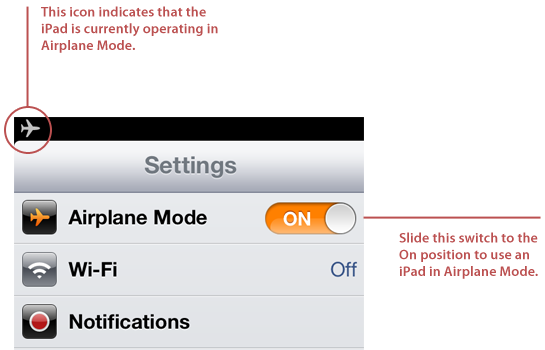 Slide the Airplane Mode switch to the Off position. You have successfully disabled Airplane Mode. Now Wi-Fi, Bluetooth, Location Services, and GPS are enabled again.